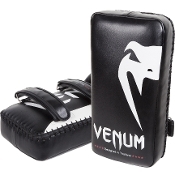 The Venum "Giant" Kick Pads are an essential tool for all styles and disciplines. The Venum "Giant" Kick Pads come with padded straps and forearm support for maximum comfort of trainer. With its multi-layered, dense foam padding, the Venum "Giant" Kick Pads absorb the heaviest kicks, knees, and strikes during training. - Premium Skintex Leather fabric. - Multi-Density foam system for better shock absorption.